Girls Can Do provides positive role models who are everyday yet extraordinary women talking about choices, determination, hardships, failure, resilience, and success. 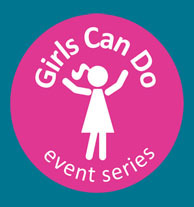 The Girls Can Do event series started with a single speaker and a small idea in January 2014. Since then, it has quickly grown into a movement with a big vision and big plans to match. By August 2014 Girls Can Do became a WA State non-profit corporation and in September received 501(c)(3) status. Our mission is to inspire a generation of possibility thinkers & to ignite a vision for equal opportunity. To encourage young women to have big dreams and pursue them. To believe that anything is possible. Our Vision is that our speakers and events inspire a generation of girls to make a difference in their lives, the lives around them, and the world. That our events give young women support, encouragement, and the knowledge that they can pursue their wildest dreams and that the opportunities are endless when you are a Possibility Thinker. The purpose of Girls Can Do is to host events around the country and the world, at no cost for young women and girls. Our events are special days where girls come to engage, connect, and share experiences with amazing women speakers who are pursuing their dreams. At each event we have access to dozens of year round programs through our Girl Partner Network, to create “next steps” for newly inspired Possibility Thinkers. We want all girls to see the endless possibilities for living a fulfilling life and to know they can make a difference in the world, big or small. Speakers getting ready before the first event at Benaroya Hall in Seattle, 2014. Girls Can Do is a WA State corporation with 501(c)(3) non-profit status.